A New Year. A New Reality. After the Chrismukkah decorations have been packed away, the long-distance relatives have come and gone, and the New Year has begun, I like getting back to a routine and some normalcy. But this year, my normal routine has shifted dramatically. Some of it’s wonderful, like the evolving routine I have established with “E”, my nearly 3 month old baby boy. And some of it’s bad. My 93 year old grandma passed away suddenly on December 5th. Due to her worsening eyesight over the years, we had a monthly routine where I would help her with errands, pay her bills, and read letters out loud from her many friends and family. For nearly 4 years, I looked forward to those visits where it was just the two of us and the Monkey, who would run around her house and inspect relics such her 8-track tape player and bubble-gum pink rotary phone. 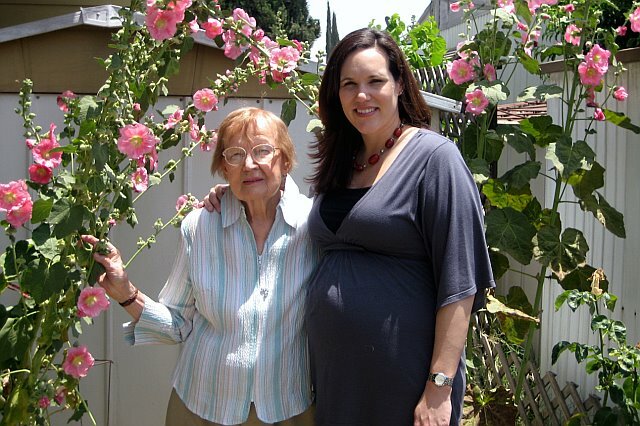 My grandma and I would chat about her childhood growing up on a farm, the 5th of 13 children. She would talk about how, after she trained to become a nurse, she left her homestead in North Dakota and took a train to California for work. She joined the military to nurse injured soldiers back to health during World War II and became a 2nd Lieutenant. She worked until she was 70 years old, all the while supporting her three kids after my grandfather had a stroke. Her story was fascinating to me and she was a huge influence and inspiration for my own path in life. Despite her old age, her death was a shock. Only 2 weeks earlier I was with her in her small yellow kitchen as she helped my Aunt and Mom prepare vegetable soup and cornbread. I started 2011 without my paternal grandparents since both of them died in 2010. And now I start this year without any of my grandparents. I know I’m very lucky to have had such positive and incredible grandparents in my life for 34-35 years. My new reality begins without them, but they will always be seared in my heart and remain in my wistful memories. As a mom, it’s hard to imagine having a problem finding childcare, and therefore having a problem finding and/or maintaining employment, because I can’t afford to provide an adequate amount of diapers to a childcare provider. But many moms out there don’t have to imagine it, because they live this problem every day. A wonderful organization close to my heart, Help a Mother Out, has introduced Diaper Action Week for the week of November 14th through November 18th in an effort to raise awareness about this problem and help make policy changes with The Diaper Act. The Diaper Act legislation aims to amend the Child Care and Development Block Grant of 1990, which will increase child care access and relieve a financial burden on families who cannot otherwise afford a sufficient amount of diapers for their children. The Diaper Act does not ask for additional federal funds. If Congress enacts the Diaper Act, eligible child care centers will have the flexibility and choice to provide diapers (disposable or cloth) to their neediest families. So how can you help? By spending a minute to sign a petition for The Diaper Act and let Congress know that you want to see changes made for struggling families. You can also help spread the word about Diaper Action Week and The Diaper Act! 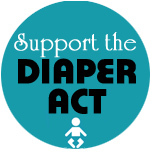 Blog, Facebook, and Tweet about #DiaperAct. It sometimes only takes a minute of your time to help make a difference. Still wearing my favorite maternity shirt complete with a "what the hell just happened" expression. A scream that the baby is coming. Tires squealing out of the driveway. Racing to the freeway. Running red lights. Barreling towards the hospital at 100 miles an hour. Throwing the car keys at the ER valet. Getting rushed to a hospital room. Nurses scrambling and the doctor rushing in mid-push. These things aren’t supposed to happen during labor. 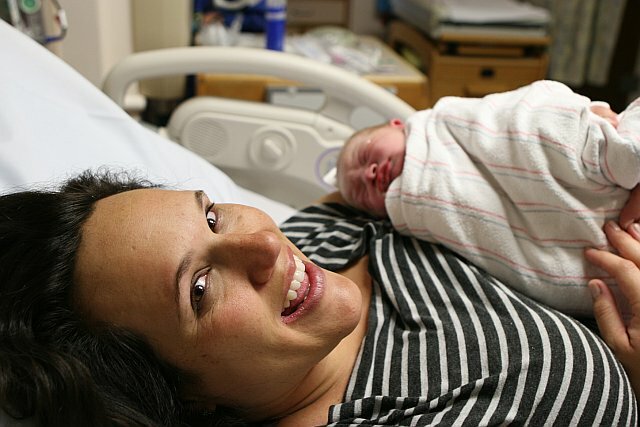 The birth of a baby isn’t usually a crazy emergency situation…or, at least, that’s what they tell us in all those birthing classes. But it can happen like that. I know, because it happened to me. Knowing that my doctor would plan an induction if I went past my due date, I spent the week leading up to 14th trying out some natural induction methods. The past few weeks had been filled with a surge of Braxton Hicks contractions and I felt optimistic that I could go into natural labor before the doctor broke out the pitocin. So, I visited my acupuncturist/chiropractor. I ate eggplant parmigiana and pineapple. I went for long walks and bribed seduced my husband. A friend of mine swore by the breast pump to kick-start things, which I tried the morning on October 13th. Later that afternoon, I visited a reflexologist for an hour long massage. 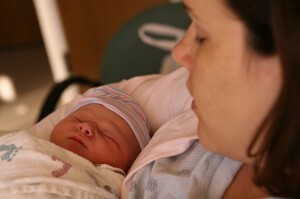 By that evening my contractions were coming along more steadily and intensely, but never painfully. I didn’t think much of it since I had been dealing with pre-labor signs for weeks. The morning of the 14th, I had two appointments – one with my OB/GYN and another with a Maternal Fetal Health Clinic. Due to my elderly maternal age of 35 and Pregnancy-Induced Hypertension, I had been deemed “high-risk” and had been monitored with NST and ultrasound exams twice a week since early September. My doctor checked me and I was barely dilated nor effaced, which wasn’t a total surprise. I was barely dilated with my first son 90 minutes before he was born. We discussed my previous labor, which we had discussed many times already, and talked about the plan to induce the following week if the baby didn’t arrive on his own. I then headed to another floor for my NST exam. The nurses noticed a decrease in the baby’s movement. I had felt him several times that morning and even during the exam, but their concern had me worried. After a discussion with my doctor, they scheduled me to go to L&D the next morning for further monitoring. I knew there was a good chance that they would keep me in L&D and induce me at the first sign of a problem. I silently begged my body and my baby to get things rolling. I was home by 1:00pm and started timing my still relatively painless contractions. The Dude had stayed home from work that day and my mom stopped by to watch the Monkey. We took our dog for a long walk, which got the contractions coming a little more consistently and intensely. By 5:00 pm, my mom had left and I was getting restless so I decided to go to Trader Joe’s with the Monkey. While waiting in line to check out, a woman with three small children started chatting me up. A contraction came during that time and she must have read my expression because she asked if I was in labor. I replied that I didn’t think so because the contractions didn’t really hurt. She gave me a look as if to say “uh, yeah you are!” and wished my luck. When I returned home, the Dude decided to run out and grab us some Indian take-out. By the time he returned at 7:00pm, I felt things were moving more quickly and that we needed to visit the hospital. When he pulled the car in the drive way, I yelled out to him to leave the car there and not bother pulling it into the garage – we were going soon. While the Dude quickly ate, we called his mom to come over and watch the Monkey. She was there within minutes and we took off. We arrived at the hospital at 7:30 pm. The admitting nurse checked me and I was at 2cm dilated and 60% effaced. My mom had met us at the hospital since I thought for sure things would be moving quickly. The contractions were coming along between 2-4 minutes apart and had become stronger and somewhat painful. I walked around the halls with the Dude. I would brace myself against a wall during a contraction while he massaged the pain in my lower back. The nurse checked me again after an hour. No change. My doctor stopped by at that point and could see that I was in pain and the contractions were coming on more regularly. She ordered a shot of Demoral to take the edge off and then told me that I should go home and labor for a few more hours and then come back. She also told me that she would probably see me later that night or early the next morning but, because I was still at 2cm, they couldn’t admit me yet unless I was in a serious amount of pain. My contractions were painful, but not unbearable, however the Demoral did nothing for me except make me a little woozy. I knew I wouldn’t be able to sleep through the contractions, but I thought I could at least go home and be comfortable while I labored. I joked about getting some Krispy Kreme donuts on the way home as a last calorie-busting hurrah before starting my post-baby diet. The nurse kept asking me my pain scale number and mentioned a few times that she thought I had a high tolerance for pain. I thought it was a weird comment since I was only at 2cm but, looking back, I realize she was trying to clue me into saying that my pain level was higher than I said so they would have to admit me. I wish I had. My Birth Plan? No Plan At All. What just happened? The Monkey and me, shortly after he made his dramatic entrance into the world. My maternal great-grandmother gave birth to 13 children. All but #13 were born at home and none of them were delivered with medicinal pain relief. My maternal grandmother delivered 3 children without any medicinal pain relief. My own mother delivered two out of three of her children without any medicinal pain relief. That’s pretty awesome of them. But, as for me? Bring on the meds. Maybe. We had a few dogs growing up but they weren’t really mine. They belonged to my mom. One dog died when I was very little and two others came into our lives when I was a teenager and rarely home long enough to spend much time with them. I have no memory of cleaning up after them, feeding them, or taking them to the vet. That was all on my mom. While I was away at college, my mom had to give up her dog because she was moving. Although I felt sad for her, it didn’t really faze me at all. When I met the Dude, he often talked about his family dogs. He treated all of his dogs like they were his siblings and, whenever a dog passed away, it was devastating for the entire family. I was moved by their dog stories, but I didn’t really get it. 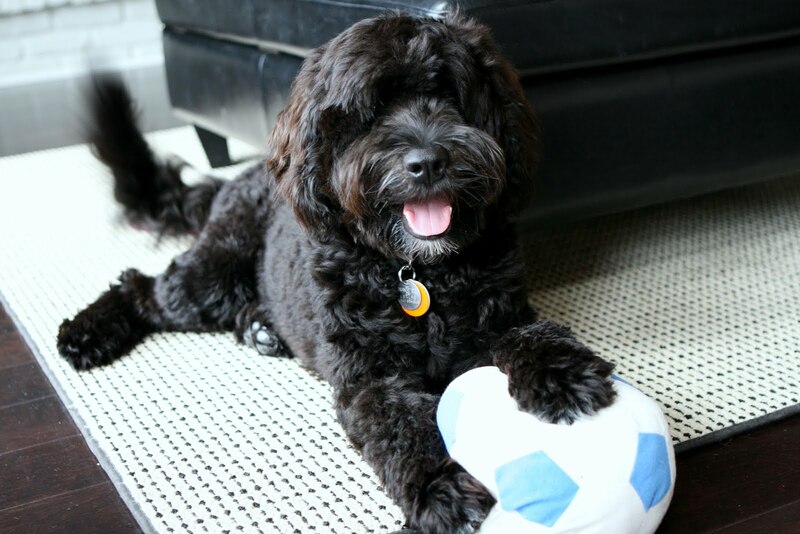 However, the Dude and his family loved their dogs and I knew that to be married into this family meant having a dog of our own one day. It took me a while to get used to that idea. I really did like dogs, but I didn’t necessarily like the idea of one living with me. They shed, they bark, they drool, they chew and, in general, they’re a big responsibility. Plus, we were living in a San Francisco apartment and I didn’t want a dog living in such a cramped space without a backyard. Then we had our Monkey and there was no way I was going to take on a new dog with an infant in the apartment.